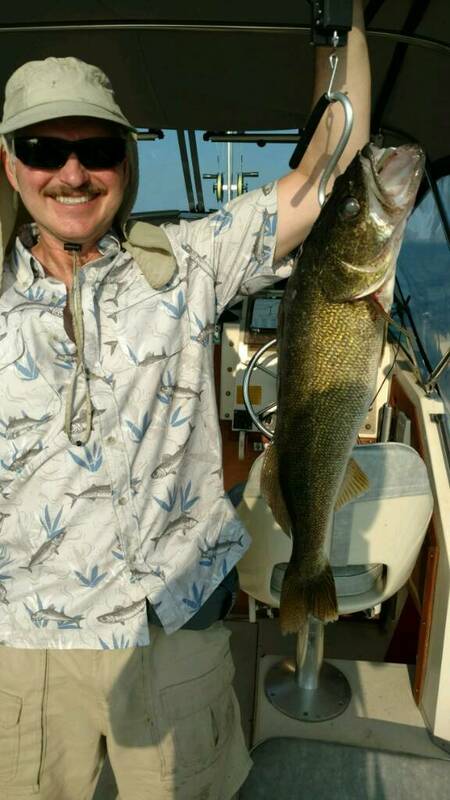 Does anyone fish these deep walleyes with these Shiver Minnow or Jigging Raps in this area? Seems like the should work here but don't hear about anybody using them. They sure look like they work well when Keith Kavajecz is using them on You Tube. Been fishing the last two days, middle gap bouncers and boards 38ft. 2 man Limit 2 hours 15 mins yesterday. Fished 4 hours today kept 15. There out there, doubled or tripled every fish. Nice catch. Looks like they are getting. bigger . I am heading there tomorrow. Did you stay in the harbor or just outside? Thanks. Nice report! We'll be at it in the morning. Good luck guys. Got to the ramp on the 4th at 0600 hours, backed the boat in, and found my winch handle WAS MISSING! What a bummer. Had to go to Cabelas and buy a new winch. So no fishing for me on the 4th. 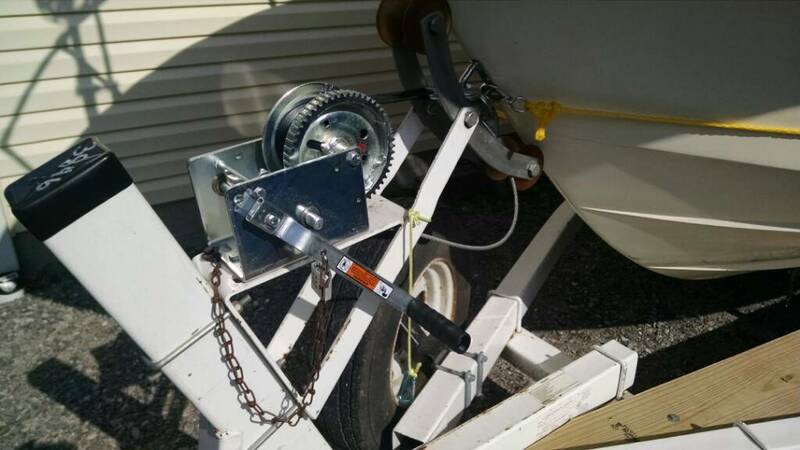 Now I have the handle chained to the trailer with a padlock. Don't know if it was stolen or fell off. There must have been 30 trailers at least there already at 0600. would have been a zoo anyways. I will try again tomorrow. wouldnt a pair of vise grips work? Hmm. Probably not. Cranks pretty hard. But you're right, I'll bet I could have used the different gear, which cranks easier. Oh well. All fixed now and handle is padlock to trailer. I was one of the guys there. I arrived at 5:00 expecting the worse but no problems. In fact, I think there were less boats there than last Friday. There are plenty of fish, but nothing of any size. I hope the western basin fish migration gets closer for me to get offshore soon. I guess it's still early. From the catt Creek last year in September it was loaded with Walleye. Seems this year so far is hit and Miss. That's why I keep everything in the boat always. Only thing I load in morning is ice! 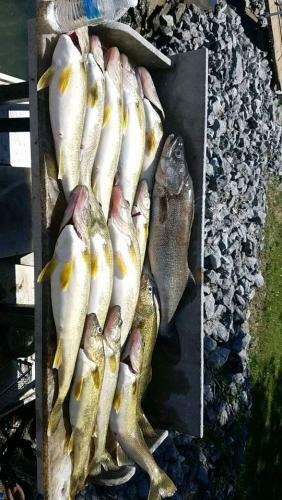 Off of Point Breeze yesterday we picked up four walleye in two hours. The screen was full of fish at 59 foot of water where all the fish were caught. Nothing at 60 foot or deeper. 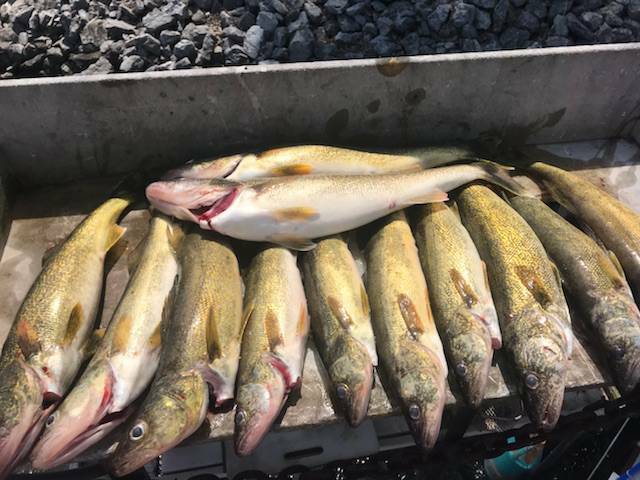 Last years great bite started with a long stretch of stable weather from the end of August through the first two weeks of September. Of course, I missed most of it by being in LA. 7/5. Got a 7 lb and a 6 lb walleye. 41 FOW. 5 COLOR LEAD. Nothing else. Didn't see much on screen. Perch jointed rapala. Here's a picture of the 7. We started at 7 am. Wish we were there earlier. thanks Jimski, guess I will make the 1 hour run to launch at CATT creek saturday. We headed out yesterday and got to the launch and realized my buddy forgot the fish finder. We were there at 04:30 and I managed to forget two poles while getting arranged. Luckily a good samaritan brought them back to us. Caught 3 very slow for us. Thinking of heading west Saturday. Going out on Friday. Going to use cranks exclusively around the windmills Seneca Shoal etc. Might try a couple of stingers off the riggers and reef runners off boards. First time out (fishing Erie). Not sure how slow my 19 ft. IO will troll. I will report back in the evening with pics if I get anything. Had a good morning out of SBH. 3&5 Color on sticks. 12 Keepers by 11:30. Out towards the line. But really marked allot of bait and bigger marks spread over a large area out there. One puked up a nice little perch in the live well. Taking my brother in law and 12 year old nephew out on Sunday (for the fist time walleye fishing). Any suggestions as to where to go/ launch, colors and depth would be greatly appreciated.